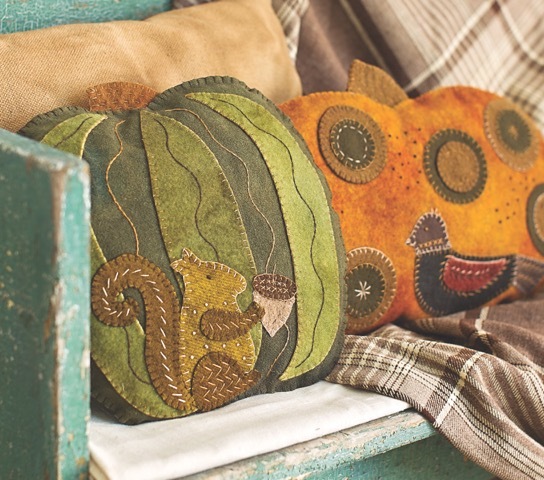 Students will enjoy stitching these sweet fall pillows while learning the basics of wool appliqué. Class instruction will include cutting out your pattern and wool pieces, basic blanket stitching and other embroidery stitches, and finishing techniques for a wool appliqué project. Students can expect to have one of the pillows completely cut out and plenty of stitching accomplished in this one-day class. This class is appropriate for beginners. Teachers can include the floss in the kit for the class. They can have different options for filler to put in the pillows. As these pillows are small and look great together, teachers could offer kits for sale of the pillow they are not teaching, for the students to stitch at home. Each student will need plenty of space for cutting and stitching. On a 6–8’ table, you can put up to 4 students if your space is limited. There should be at least two ironing stations with a total of at least 6 irons for a 12-student class. A central garbage can or small garbage receptacle on each table helps to keep an organized classroom. Instructions for Pillows from the Patch can be found on p. 54. 1. Teachers will begin by instructing students on cutting out their patterns and wool pieces. While there are several methods used, the one is outlined in the book makes for a well cut out project with smooth edges to the wool (p. 90). 2. The next step is to guide the students in the best way to attach the wool pieces for stitching. Again, there are a variety of ways to do this, and one of them can be found on p. 90. 3. By teaching the blanket stitch as demonstrated in the book, teachers will show the students how to use a method that not only works very well, but also allows the stitching to look very neat and precise. See p. 91. 4. As the day goes on, teachers will find that students work at various levels of speed and skill. At some point teachers will want to go over the various embellishment stitches used in the project. See pp. 92–93. 5. Teachers should go over the finishing instructions, such as ironing the finished piece, adding the filler to the pillow, and blanket stitching the outer edge of the pillow project. See pp. 58–59.